Lawrence Whittet '78 is working in Dubai on the world's largest solar power plant. Solar energy is free and sustainable energy harvested directly from the sun. Dubai is a city-state in the United Arab Emirates located on the Persian Gulf. Illinois State University is Illinois’ first public university located in Bloomington-Normal. So what do solar energy, Dubai, and Illinois State University all have in common? His name is Lawrence Whittet. Whittet graduated from Illinois State in 1978 with a bachelor’s in management. Forty years later, the Illinois State alumnus finds himself working in Dubai for Sterling and Wilson on what is going to be the world’s largest solar power plant. Solar energy requires very little maintenance after it is completed- it is sustainable. Along with its cost efficiency, its benefits are reducing the carbon footprint every day. The solar plant in Dubai will be roughly 1170 megawatts and will take a record-breaking year and a half to complete. There are about 1,600 people onsite, and it is expected to increase to about 2,000 by mid-summer. 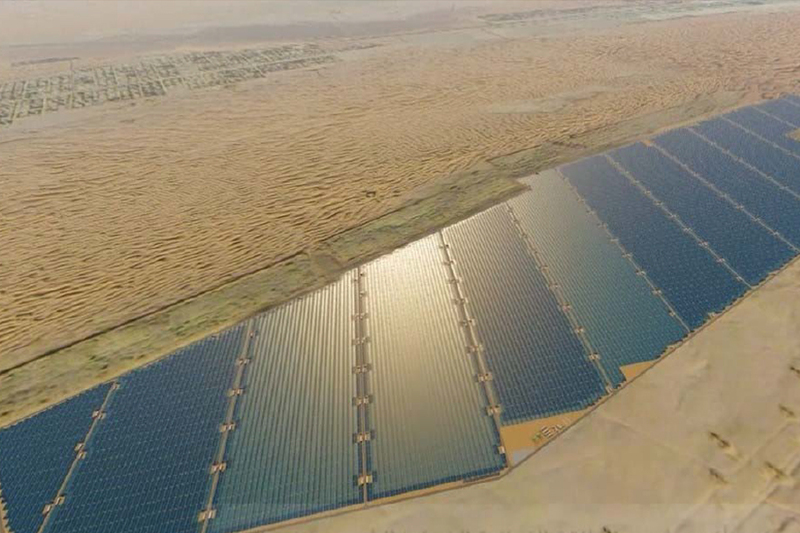 A bird’s-eye view of the world’s largest solar power plant under construction. Before his career with Sterling and Wilson, Whittet lived in Texas. His family, including four grown children and 11 grandchildren, still live in the Dallas-Fort Worth area. As a family man and sports buff, Whittet admitted to missing his family and close friends, along with ESPN and watching Illinois State athletics on the big screen. Whittet is a true Redbird fan. He has had season tickets for both football and basketball since 1982 and gives annually to the Weisbecker Scholarship Fund. Although his line of work takes him far from Normal, every year he finds a way to get back for the Homecoming festivities and a basketball game during the holidays. In regards to his free time, Whittet has ventured off to Abu Dhabi, the Louvre, and camel riding in the desert-casual weekend getaways. For the most part, he is extremely invested and in love with his work. “We work six days a week, 12 hours a day,” said Whittet. “I am usually up at 5 a.m., at the project by 7 a.m., and back to the accommodations for dinner by 7 p.m.” By 9 p.m. Whittet is showered, fed, and ready to sleep. He joked about his Illinois State days when he would just be going out at that time. Whittet’s time at Illinois State was a “core substance” to get him to where he is today. He always knew his decision to major in management would lead him to success. “It was a field that I could excel and apply to the construction industry that I was born into,” said Whittet. His leadership, organizational management, planning, and communication skills have helped the solar plant progress. Whittet attributes his career success and passion to his three mottos that he prescribes to in all aspects of life. Whittet’s hope is for this line of work to take him to retirement over the next five to seven years. For him, being associated with Sterling and Wilson on the construction of the world’s largest solar plant is the experience of a lifetime. He owes much of his success to his time spent at Illinois State in the management program. “As I reflect on it now, it was exactly what I needed as it is the foundation of what I have been doing and I continue to do today,” said Whittet. His advice for young minds seeking this field of work is to find internships, have passion, and build relationships. Whittet is the picture of commitment, hard work, and everything it means to be a Redbird alum.